Blogs create a way for people to share their thoughts, pass on information and connect with others from around the world. Blogs provide countless individuals with a door to the world. However, for many individuals, blogs slam shut that door by creating as much of a barrier as stairs do for wheelchair users in the brick-n-mortar world. Within the confines of their blogging platform, there are ways bloggers can increase accessibility for people with some kinds of disabilities. Images present problems for people with sight impairments using screen readers â€“ software that reads aloud what is displayed on the computer screen. This technology cannot read content presented in an image or graphic format. Also, individuals with older computers or slow Internet connections may surf with image loading turned off and will miss information presented visually. Individuals not able to see the image would hear or read “Accessibility 100”. They receive equivalent information. Other blogging platforms will vary in how the ALT attribute is inserted. For bloggers comfortable with HTML, the platform may allow them to insert the attribute manually. ALT text must communicate the purpose of a graphic accurately and succinctly. if the image is purely eye candy, in which case the null ALT is appropriate. Without an ALT present, even a null one, an individual using a screen reader would hear “image”. Not using images is not a solution. Images can increase comprehension and usability for others. Like sighted individuals, people using screen readers often scan a webpage for hypertext links that may interest them. Links like “click here” or “more” make no sense when read out of context. To increase the accessibility of your blog, make hypertext links informative when read out of context, whether they are on their own or as part of a sequence of links. Make link text succinct. Listen in on the interview here. Blogs entails countless hours of reading. Enhance readability by maximizing contrast between text and background colours. Black on white is the most legible; white on black is reasonably legible; other colours on black are less legible. Mixing yellow and black is fairly legible. If using red or green text, make it large and bold enough to be legible in yellow. Black on red and black on green are not legible, as some people will see them as black on black. Combining blue and black is legible enough as long as it is not used for fine detail (e.g., paragraph text). Combinations such as red-blue, green-yellow, green-white, green-gray are poor. Colour blindness and the web will be discussed further in a future Accessibility 100 post. Audio and video add another dimension to blogs. These mediums benefit individuals with some kinds of disabilities, such as learning disabilities or cognitive impairments, who find reading long pieces of text difficult and laborious. Bloggers are inundated with spam comments. CAPTCHAs â€“ Completely Automated Public Turing test to tell Computers and Humans Apart â€“ are frequently used to weed out spambot comments from human comments. One solution is to a combination of visual and audio CAPTCHAs. But, then people who are deaf-blind are excluded. Avoid using CAPTCHAs, where possible, to moderate blog comments. Instead, use Askimet or other spam filters to control that unwanted spam. Make it as easy as possible to participate in your blog’s community. Do It Myself Blog - Glenda Watson Hyatt » Are Negative CAPTCHAs Any More Accessible? This is excellent stuff Glenda, thank you. I’d find it useful to know how to do a transcript from a podcast – is there a free or low cost way to do this? I want to be fair to all the people who happen across my art blog, but I don’t think it’s possible to describe my paintings in the alt tags to any degree other basic generalities. “it’s a girl standing next to a pegasus drawn in charcoal” I could do that but does it really matter in my case? Would the sight impaired bother to go to my art blog in the first place? This is great, Glenda! I’m going to send it to some of my contacts in the dialogue universe who use blogs on their websites. This is very informative information. I would very much like to chat with you about learning some of this material and other questions I have. I have C.P. and wrote to you almost a year ago asking you some pertinent questions about your published book, and all I got was this link to your site and no reply. It sure would be nice to talk or chat with you online about many questions I have which I think you might be able to answer. Your blog is truly wonderful and has much useful information. I do hope you will take the time to reply personally at your earliest convenience. You start out by saying “Black on white is the most legible; white on black is reasonably legible” but black on white and white on black are not about color contrast, they are brightness contrast, which is something different. More importantly, black on white is not “most legible” for everyone: maximizing brightness contrast is actually something to be avoided. There should be a minimum level of contrast, but maximizing it will actually make text hard or very tiring to read for people with certain vision problems. A better approach is to actually avoid the maximum contrast of black on white (an white on black) and use black on a light pastel or light grey background – that will provide sufficient contrast for nearly everyone while avoiding the too-high contrast that can make text actually hard to read. There’s a reason there are browser plugins that do nothing but disable the white background of web pages! As to actual color contrast, again this has to be sufficient but “maximum” might cause problems as well. the FAE toolbar (see below) has a check built in; another good tool to check is the Juicy Studio Colour Contrast Analyser. 2. Re: Avoid CAPTCHAs I couldn’t agree more, but the article you link to suggests no good alternatives are available. Actually, there are. There’s a whole range of options, and you can use mix-and-match with them. One of the best ones is variously known as “negative captcha” or “gotcha”: rather than asking humans to prove they are not bots, it trips up bots and causes them to prove they are bots, by providing a field (hidden by a stylesheet) that should not be filled in (or have its content not changed). Most bots tend to fill in every field, so they will trip over themselves here – while humans don’t need to do anything at all. 3. Finally, re: your Additional resources: the Web Accessibility Toolbar mentioned there is mostly aimed at developers; unfortunately, most developers don’t use Internet Explorer for development (at most, during a final testing phase) — and this toolbar is for IE only although nowhere on the page this is actually specified. Not to worry, there are several good accessibility toolbars for Firefox (etc.) too – see my two blog posts WAVE toolbar released and FAE: More toolbar goodness. The WAVE toolbar is not only very useful, but also already compatible with upcoming Firefox version 3; the FAE toolbar isn’t compatible with Fx3 yet, and a little buggy but otherwise quite useful. And of course Chris Pederick’s Web Developer toolbar has a lot of tools useful for accessibility testing as well. Keep up the good work with your series – I’m already looking forward to the next installment! Joanna, Darrell mentioned he would share his process for creating a transcript in this month’s podcast. I’ll ask him if a free or inexpensive method exists. Darren, good point. Sight impairments vary in degree; it doesn’t necessarily mean complete loss of vision. An art lover who then loss some vision may, indeed, enjoy your blog. I will look into this further. 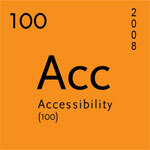 Sounds like a good follow-up Accessibility 100 post! Thanks Karen and Avril, much appreciated. Karen Lynn, thanks for your kind words. I’ll email you shortly. Marjolein, wow, thanks for your detailed! Yes, colour contrast is a little more complicated than what I shared in this post – I was aiming for simple for now. Colour will be covered in more detail in a future post. And, thanks for the tip on gotchas. I hadn’t heard of those. I tried the ALT descriptions on my pics today, and guess what… THEY WORKED!!!!!!! AND it was so easy… I didn’t realize it, but blogger already has the alt”” in the code, all you have to do is type the description between the quotation marks!!!! THANKS SO MUCH!!!!! My friend Alison, who is blind and reads my blog sometimes, will be so surprised when she visits me the next time!!!!!!!!!!! Jana, that’s great! Thanks for letting me know how Blogger handles ALTs. I’m curious to hear how the other blogging platforms work. Let us know what Alison says. Great post. 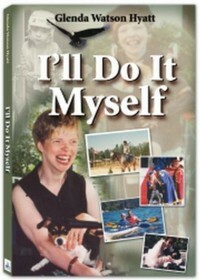 I work for a client who is likely to be developing more blogs for outreach, and who must be as accessible as possible. Thanks for laying this out so well. WCAG 2.0 said labels should be placed on the left of input fields. And labels for radiobuttons or checkboxes are on the right of it. But, common WordPress themes put the label on the right. What do you think based on your experiences? Dani, good point. The problem is that many theme designers lack knowledge in web accessibility, thus not many themes are accessible. If you do come across truly accessible themes, please let me know.